« Often Overlooked Safety Traps Put Children at Risk! Jewelry is such a personal statement and what you choose to wear should really reflect who you are, if possible. 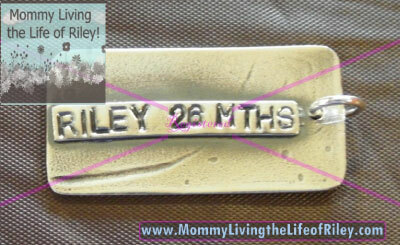 That's why I am such a nut over personalized jewelry! Not only do I love showing off this kind of jewelry to my family and friends who understand the meaning behind the pieces I have, I also love looking at it myself. No matter what's going on or how hectic my day may be, every time I look at a piece of jewelry I'm wearing which has my daughter's name on it, I smile and remember how important she is to me. Lauren Nicole Jewelry & Gifts has always made a wide variety of personalized jewelry, but this time, they've even managed to top themselves with the Little Artist Pendant. Keep reading to learn more! I reviewed the Little Artist Pendant from Lauren Nicole Jewelry & Gifts, which retails for $54.00. Receive 15% OFF of your entire purchase by using coupon code "FACEBOOK". The Little Artist Pendant is a unique concept in personalized jewelry, because you actually get the opportunity to have an original piece of artwork from your child engraved on a pure silver pendant. When I learned that I would have the chance to review this line of jewelry from Lauren Nicole Jewelry & Gifts, I immediately knew what I would want to have displayed. Only a few weeks ago, Riley actually drew her very first picture, and I as a mommy, was extremely proud of her. Now, I could forever remember this precious balloon and always wear it with me on the Little Artist Pendant. 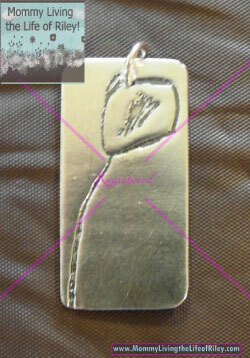 Lauren Nicole Jewelry & Gifts actually creates a mold from your child's artwork to cast the pendant. Once you email them with a scanned picture of your child's masterpiece, they immediately get to work. It is recommended that the piece of artwork you choose have bold lines, for they will show up better than intricate shading. As you can see below, Riley's balloon came out great! The only thing that disappointed me about the finished product was how they placed the pendant's hole through the top of my daughter's balloon. I don't understand why her picture wasn't moved down a little or the hole placed a little higher so that her balloon didn't have a hole in it. Other than that, I thought the pendant came out beautifully. I especially liked how Lauren Nicole Jewelry & Gifts even adds a custom plaque to the back of your pendant with anything on it you choose. I wanted to add Riley's name as well as her age when she drew this picture. Now, I will forever remember that Riley was just 26 months old when she started to draw actual pictures instead of just scribbling on the paper. If you have a favorite drawing from your child or grandchild that you would like to commemorate in a piece of jewelry, then I highly recommend the Little Artist series of jewelry from Lauren Nicole Jewelry & Gifts. This pendant has easily become one of my favorite pieces, for now I will always remember my little girl drawing her first balloon, every time I look at it! Disclosure: I received the Little Artist Pendant from Lauren Nicole Jewelry & Gifts in order to facilitate my review. No other compensation was received. This product review is based on my own personal experiences with this item and is completely honest and objective.